Bramptons Butchers & Cheese Shop – Bramptons, the home of great British meat and exquisite cheeses! Bramptons Butchers is a traditional butchers shop that has been trading on the same site since 1873. In 1902 it was granted a Royal Warrant by King Edward VII. The current proprietor, Paul Williams, is a classically trained chef who served his apprenticeship as a butcher at Bramptons over 30 years ago. Paul is renowned for his ‘naturally’ reared produced products and principles. At Bramptons we ensure quality in local, free-ranging Beef, Lamb and Pigs. We pride ourselves in the fact that most of our meat is free-range and is mainly sourced from farms around Sussex. We are also well known for producing our own gluten-free sausages, linked by hand, just as they did in the old days. Next door to the butcher's shop we also have a cheese shop. We stock a wide range of Sussex Cheeses, many of which are award winners! Along with many other kinds of British cheese we also have many of your Continental favourites. Bramptons are also Associate Members of the Master Chefs Of Great Britain. Bramptons are an award winning butchers having won the Sussex Food & Drink, Sussex Butcher Of The Year Award twice and finished runner-up on three other occasions. We have an exciting range of cheeses for every occasion. Choose from our wide selection of local and continental cheeses. Franziska is there to help you make the right choice. 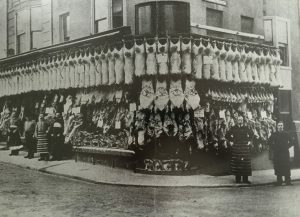 The shop is located on St Georges Road in the heart of Kemp Town, Brighton, where there are many other specialised shops. We feel that there is no other road in Brighton quite like it!